Ecommerce, with all its convenience, was supposed to be the death of traditional retail. That’s why hearing ecommerce leaders get excited over opening brick and mortar storefronts feels a bit like having your tech-obsessed friend talk up VHS. Designer-gown rental service Rent the Runway, clothing retailerBonobos, and beauty-products subscription company Birchbox all started as Internet-based businesses — and now they each have physical stores. What’s more, all three New York City-based companies say their brick and mortar retail experience is different and better because of their ecommerce roots. The three founders talked at a panel discussion in New York City earlier this month hosted by the American Express U.S. Small Merchants Group. For Rent the Runway, which has raised $54 million in in venture capital and has over 5 million members, the notion of opening a store came from customers. “A big belief that we have had at Rent the Runway is listen to your customers and create enough channels that you are always listening and responding to [them],” said co-founder Jennifer Fleiss. Founded in 2009, Rent the Runway’s mission is to democratize fashion by giving people the chance to rent designer dresses for a fraction of the retail price. “After we heard enough requests for a physical store, we were like, ‘Let’s test it out.’ This wasn’t the initial plan, this wasn’t the initial model, but what harm could it do?” Fleiss said. Rent the Runway didn’t invest much capital in its first physical location; the store was set up in August 2012 in its corporate headquarters. It was a hit — and it’s not hard to understand why: women like to touch and try on fancy dresses. Since then, the company has opened a freestanding Rent the Runway retail shop at another location in New York City and another in the Cosmopolitan Hotel Las Vegas. Dunn founded Bonobos out of his New York City apartment in 2007 exclusively as a men’s pants online store. He was motivated by a desire to create men’s pants that were tailored European-style, but without the tight fit. The company had so much momentum from its pants, trademarked by a slightly curved waistline, that nobody went for Bonobos’ dress shirts when it began making them. The company needed a way to get men trying on their shirts: thus, the idea for a walk-in, brick and mortar location was born. Rent the Runway’s retail store on 18th Street in New York City opened in Sept. of 2014. “We spent our first few years: online only, online only! This is the future of retail! And a lot of people were saying, ‘Stores are going away!’” Dunn said. Bonobos’ 10 brick and mortar locations are called “guideshops.” Unlike traditional retail shops, they stock no inventory. Rather, customers make appointments with stylists, or “guides,” get fitted, place their order online through the stylist and get their custom-fit clothing delivered to their homes. The combination retail shop-online order has been a hit, and Dunn said that Bonobos has plans for another 30 guideshop locations to open up in the next three years. Birchbox co-founder Katia Beauchamp said she, too, was not expecting to be managing a retail store. “We never imagined that we were going to be opening a brick and mortar store because the whole premise of Birchbox, the whole reason we started, was because it really sucked to purchase beauty products on the Internet and frankly — it wasn’t happening,” she said. Birchbox members receive a curated box of beauty samples at regular intervals throughout the year. With the samples come usage tips and customers can buy products they like directly from the Birchbox website. 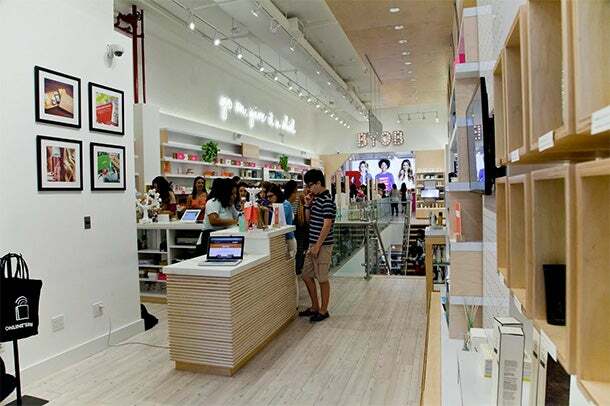 The first Birchbox retail location opened in New York City two months ago and the concept is experience-driven. Customers can sample products, get their nails and hair done and take a variety of classes on skincare, makeup application and hair styling. The layout of the physical store parallels the organization of an online shopping experience. Typically, in stores, beauty products are organized by brand; in the Birchbox retail store, products are organized by product type, just as they are online. “Our store is merchandised like the Internet,” said Beauchamp. Fleiss, Dunn and Beauchamp are all open about their about-face on the viability of opening physical stores. They also realize that their online businesses are giving them a leg-up in the brick and mortar game. For example, Fleiss says that the data her team has on every Rent the Runway member who comes into their retail shop enables stylists to offer a superior customer-service experience. Based on member data online, Rent the Runway stylists can “pre-curate” dresses for each customer before she shows up at the store. At the Birchbox retail location in New York City, customers can sample products, shop, take classes and get beauty services done. Of course, there’s the question of overhead. There’s no getting around the fact that operating a store is expensive, particularly in New York City. And there’s the cost of hiring people to staff your location. Fleiss of Rent the Runway, for one, was worried about whether the cost would be worth it. So far, she says people have been spending more in the physical store, offsetting the higher overhead. “What has actually turned out to be the case is that conversion is higher at the store, and average order size is higher in the store,” she says. The reason customers spend more in person? When a customer is trying on a dress, the stylist can recommend accessories and bring up other occasions that might require a glamorous outfit. Also, customers that interact with Rent the Runway offline end up being better online customers, too. “We do see that all channels raise boats together,” Fleiss says. The steepest learning curve for these ecommerce entrepreneurs has been managing to train the staff in the stores. For Bonobos, with its hybrid ecommerce-retail stores, having golden customer service is what makes or breaks its stores’ profitability. When Dunn’s mother informed him that she was disappointed in the lack of attention she received during a recent visit to the Bonobos store in Chicago, Dunn flew a manager from his high-performing store in Austin, Texas, to give the Chicago team additional training. When hiring for stores, Dunn says he looks for people who are both obsessed with customer service and who get excited about technology and ecommerce. That can be hard to find. “We were searching for what I refer to as the ‘unicorn,’ someone who understood the old world and is excited about the new world,” he says. As retail works to find its sweet spot somewhere between Main Street and your mobile phone, there are likely to be a whole lot more retailers searching for that unicorn in coming years. This entry was posted in eCommerce Global, Ecommerce News and tagged africa, brick and mortar, ecommerce, online sales, online shop, online store, sell online, south africa by e-Commerce News. Bookmark the permalink.